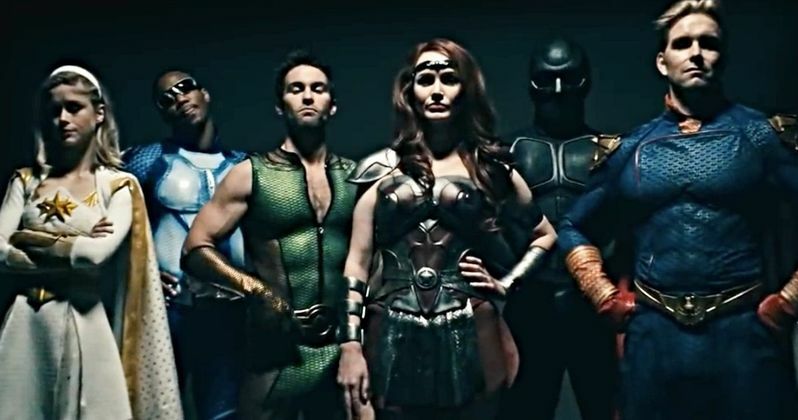 The first full-length trailer for Amazon's The Boys is here. A teaser was previously revealed during New York Comic Con, but that was more of an atmospheric video that helped to establish a tone. This, on the other hand, is our first real look at some footage from the adaptation of the Garth Ennis and Darick Robertson comic book of the same name. The series is produced by Seth Rogen and Evan Goldberg and it looks a lot like what we've come to expect from the prolific duo when it comes to their work on the small screen. The trailer itself is very much a teaser. It's a series of very quick glimpses at scenes from the show, giving us the briefest of looks, with very little context, of the characters we're set to follow. But it's clear from the imagery alone that this isn't going to be a show about do-gooders in tights who want to save the world. This looks to be a gritty, sultry and darkly comedic take on the superhero genre. Seth Rogen took to Twitter to reveal the trailer today and had this to say about it. "Based on one of my favorite comics of all time, I'm proud to have helped bring #TheBoys to life. Here's a taste of our new show, coming to Amazon this year"
The Boys centers on a group of vigilantes who live in a world where superheroes embrace the darker side of their massive celebrity and fame. They set out to take down corrupt caped crusaders armed with only their working-man grit and a willingness to fight dirty. The Boys is described as "a fun and irreverent take on what happens when superheroes, who are as popular as celebrities, as influential as politicians and as revered as Gods, abuse their superpowers rather than use them for good." The series will focus on the dynamic between the powerless and the super powerful as The Boys set off on a journey to expose the truth about a famed group of heroes known as "The Seven," and Vought, the multi-billion dollar company that manages them. As a comic, The Boys launched in 2006 and ran for a total of 72 issues through 2012. Seth Rogen and Evan Goldberg are also behind AMC's Preacher, which is also based on a comic by Garth Ennis. Eric Kripke, of Supernatural fame, is on board as a writer and executive producer. Dan Trachtenberg, best known for his work on 10 Cloverfield Lane, directed the pilot. The cast is absolutely stacked, as it includes Karl Urban, Karen Fukuhara, Laz Alonso, Tomer Kapon, Antony Starr, Dominique McElligott, Jesse T. Usher, Chace Crawford, Simon Pegg and Jack Quaid. And, not for nothing, but the last time Urban was in a comic book adaptation, we got Dredd. A premiere date hasn't been set, but The Boys will debut in summer 2019. Be sure to check out the new trailer from the Amazon Prime Video YouTube channel below.